Although we left Kritsa in sunshine, there was a cool wind and we thought it would be a good day to do a hike that has languished on our ‘must do’ list for a long time. If you take the road from Malia towards the Lassithi Plateau and drive uphill for 4.5k you will reach this layby/picnic area. There is a clear sign showing you are in Hamorprina, and there is room to leave two or three cars off the road. From here we could see it was still sunny down at the coast, but clouds were gathering over the mountains. With hindsight, it would have been best to put the hike of until another day as the breeze was chill and the overcast views disappointing. The clearly marked path was a doddle. The difficulty came from the steepness of the first two kilometres. When we stopped for a coffee, I checked my Wikiloc route tracker and my husband said it wasn’t working as it had barely recorded 2k. In fact, it was working well and our total walk in the day was 10.6k. To view the map and details on Wikiloc Click Here. As we neared the bottom of a peak loose dogs made me nervous. I had no need to worry, the owner of the smallholding watched us approach and kept the dogs under control. 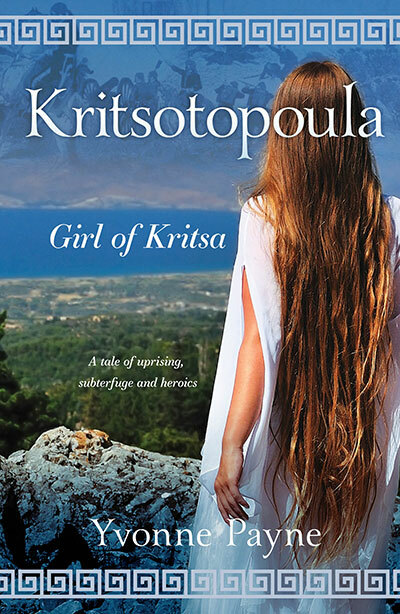 After this, we enjoyed a stroll to the village of Krassi, famous for huge platanos trees, Venetian water cisterns, and an atmospheric scene in Kritsotopoula, Girl of Kritsa when Christian rebels enjoyed a night of revelry. The high spot of the day was in Krassi – yummy coffee with cinnamon cheese pies, drenched in honey. Well, we needed the energy burst! The thought of walking back over the mountain, and down very steep scree, was not attractive. We decided to walk along and down the main road – not something I’d recommend in the tourist season when roads are busy. This hike is back on the ‘must do’ list. Next time we will team up with friends to leave one car in Krassi, and then we can all go down to the start at Hamorprina. As long as we choose a bright, cool, and windless day we’ll have fun exploring further up the mountains and skip the road walk down. Very nice to see this hike. I’ve been on hikes like that! Looks like a beautiful view though. Sounds and looks lovely. You and Alan are truly “blessed”. I do like the thought of doing the hike and eating the cinnamon cheese pies. I don’t think I have ever knowingly had one. Are they like Sfakia pies?